Neil Gaiman, who brought us one of the best commencement speeches ever, chimes in on with a lecture explaining why using our imaginations is an obligation for all citizens. The correlation between illiteracy and prison growth. I was once in New York, and I listened to a talk about the building of private prisons – a huge growth industry in America. The prison industry needs to plan its future growth – how many cells are they going to need? How many prisoners are there going to be, 15 years from now? And they found they could predict it very easily, using a pretty simple algorithm, based on asking what percentage of 10 and 11-year-olds couldn’t read. And certainly couldn’t read for pleasure. It’s not one to one: you can’t say that a literate society has no criminality. But there are very real correlations. Literacy is more important now then ever. Literacy is more important than ever it was, in this world of text and email, a world of written information. We need to read and write, we need global citizens who can read comfortably, comprehend what they are reading, understand nuance, and make themselves understood. On fiction as a gateway drug. Fiction has two uses. Firstly, it’s a gateway drug to reading. The drive to know what happens next, to want to turn the page, the need to keep going, even if it’s hard, because someone’s in trouble and you have to know how it’s all going to end … that’s a very real drive. And it forces you to learn new words, to think new thoughts, to keep going. To discover that reading per se is pleasurable. Once you learn that, you’re on the road to reading everything. And reading is key. [W]ords are more important than they ever were: we navigate the world with words, and as the world slips onto the web, we need to follow, to communicate and to comprehend what we are reading. People who cannot understand each other cannot exchange ideas, cannot communicate, and translation programs only go so far. And the second thing fiction does is to build empathy. … Empathy is a tool for building people into groups, for allowing us to function as more than self-obsessed individuals. How well-meaning adults can kill a love of reading. Well-meaning adults can easily destroy a child’s love of reading: stop them reading what they enjoy, or give them worthy-but-dull books that you like, the 21st-century equivalents of Victorian “improving” literature. You’ll wind up with a generation convinced that reading is uncool and worse, unpleasant. … Another way to destroy a child’s love of reading, of course, is to make sure there are no books of any kind around. Science fiction makes its way to China and the importance of imagination. On the value of libraries and why anyone who sees them as nothing more than a shelf of books misses the point. [L]ibraries are about freedom. Freedom to read, freedom of ideas, freedom of communication. They are about education (which is not a process that finishes the day we leave school or university), about entertainment, about making safe spaces, and about access to information. On moving from an information scarce society to one overloaded. Information has value, and the right information has enormous value. For all of human history, we have lived in a time of information scarcity, and having the needed information was always important, and always worth something: when to plant crops, where to find things, maps and histories and stories – they were always good for a meal and company. Information was a valuable thing, and those who had it or could obtain it could charge for that service. In the last few years, we’ve moved from an information-scarce economy to one driven by an information glut. Books are a gateway to making friends with the eminent dead. Books are the way that we communicate with the dead. The way that we learn lessons from those who are no longer with us, that humanity has built on itself, progressed, made knowledge incremental rather than something that has to be relearned, over and over. There are tales that are older than most countries, tales that have long outlasted the cultures and the buildings in which they were first told. Stories are the way in which we teach moral lessons, keep an audience engaged in what we’re saying, and convince others to pursue a course of action. In the business world, where time is short, and you need to make a point quickly the favorite device is the anecdote. These short stories help others see your point of view. I can’t count the number of times I’ve been in a meeting where all of the evidence is pointing towards a clear path when someone, usually someone in a senior position, offers up and anecdotal counter-example. You want to quit smoking? Why? My grandfather smoked a pack a day and he lived till 92. And that’s all it takes. The meeting is over. All the evidence in the world doesn’t matter anymore. This simple anecdote now has everyone ignoring the evidence and statistical distribution and focusing on the grandfather. The problem is stories don’t really encourage us to think. They make it easy to overlook evidence, fall prey to cognitive biases, and generally encourage bad decisions. Stories are an important weapon to have in our arsenal. As someone trying to persuade others, you can have all the facts you want but if you can’t tell a story people won’t listen. In response to a question recently, Demian Farnworth, a writer at copyblogger, offered up four books copywriters should read to improve their ability to tell a good story. He spends his day writing stories and highly recommends you read these four books if you want to learn how to tell better stories. The First Five Pages: A Writer’s Guide To Staying Out of the Rejection Pile, by Noah Lukeman. Made to Stick: Why Some Ideas Survive and Others Die, by Chip and Dan Heath. How to Write a Damn Good Novel: A Step-by-Step No Nonsense Guide to Dramatic Storytelling, by James N. Frey. Writing the Breakout Novel, by Donald Maas. And sales copy is just a fancy way of persuading people to come around to your point of view. Just make sure you’ve done the work. Ira Glass, host of This American Life, gives a funny and thought-provoking talk from the 2007 Gel Conference on what makes a great radio program. Along the way he offers some tips on what makes a good story, how to hold the listener’s attention, and how to tie the story into your post. We’re ok cheating, as long as its just a little and unnoticeable. as long as we cheat by only a little bit, we can benefit from cheating and still view ourselves as marvelous human beings. This balancing act is the process of rationalization, and it is the basis of what we’ll call the fudge factor theory. Something that stood out for me was the chapter on the relationship between creativity and dishonesty. According to Ariely, the link between creativity and dishonesty is not as straightforward as we might think — The more creative we are the better we are at rationalising dishonest behavior. We may not always know exactly why we do what we do, choose what we choose, or feel what we feel. But the obscurity of our real motivations doesn’t stop us from creating perfectly logical-sounding reasons for our actions, decisions, and feelings. … We all want explanations for why we behave as we do and for the ways the world around us functions. Even when our feeble explanations have little to do with reality. We’re storytelling creatures by nature, and we tell ourselves story after story until we come up with an explanation that we like and that sounds reasonable enough to believe. And when the story portrays us in a more glowing and positive light, so much the better. We’re storytelling creatures by nature, and we tell ourselves story after story until we come up with an explanation that we like and that sounds reasonable enough to believe. And when the story portrays us in a more glowing and positive light, so much the better. One factor that Ariely didn’t contemplate that I think it is important is how our environment — whether we’re in an environment of abundance or scarcity — affects our moral compass. Intuitively, I think it’s a lot easier to rationalise moral transgressions in an environment of scarcity than one of abundance. The (Honest) Truth About Dishonesty: How We Lie to Everyone—Especially Ourselves is worth reading in its entirety. In his new book Mastery, Robert Greene writes discusses how feeling powerless directs the narratives of our mind. We live in a world that seems increasingly beyond our control. Our livelihoods are at the whim of globalized forces. The problems that we face—economic, environmental, and so on—cannot be solved by our individual actions. Our politicians are distant and unresponsive to our desires. A natural response when people feel overwhelmed is to retreat into various forms of passivity. If we don’t try too much in life, if we limit our circle of action, we can give ourselves the illusion of control. The less we attempt, the less chances of failure. If we can make it look like we are not really responsible for our fate, for what happens to us in life, then our apparent powerlessness is more palatable. For this reason we become attracted to certain narratives: it is genetics that determines much of what we do; we are just products of our times; the individual is just a myth; human behavior can be reduced to statistical trends. Many take this change in value a step further, giving their passivity a positive veneer. They romanticize the self-destructive artist who loses control of him- or herself. Anything that smacks of discipline or effort seems fussy and passé: what matters is the feeling behind the artwork, and any hint of craftsmanship or work violates this principle. They come to accept things that are made cheaply and quickly. The idea that they might have to expend much effort to get what they want has been eroded by the proliferation of devices that do so much of the work for them, fostering the idea that they deserve all of this—that it is their inherent right to have and to consume what they want. “Why bother working for years to attain mastery when we can have so much power with very little effort? Technology will solve everything.” This passivity has even assumed a moral stance: “mastery and power are evil; they are the domain of patriarchal elites who oppress us; power is inherently bad; better to opt out of the system altogether,” or at least make it look that way. In The Success Equation: Untangling Skill and Luck in Business, Sports, and Investing, Michael Mauboussin goes beyond the general idea that luck is important to outcomes. He explains the type of interactions where luck is important and dives into why we have a difficult time comprehending the role of luck. Mauboussin goes on to explain how we should untangle skill and luck so we can get a feel for where they fall on the luck-skill continuum. “Where an activity falls on that continuum,” he writes “provides a great deal of insight into how to deal with it.” Skill tends to follow an arc – improving, stagnating, and then ultimately going lower. In activities where the results are independent of one another, simple models effectively explain what we see. But when a past result affects a future result, predicting winners becomes very difficult. The most skillful don’t always win. 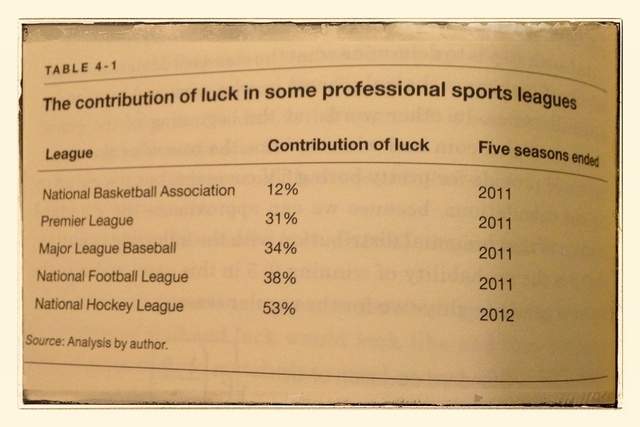 And something to keep in mind, “the contribution of luck has been rising steadily over time in most sports, which means that the players are all converging on an equal level of skill.” Although, this doesn’t apply to basketball. The problem with this sort of automatic decision-making apparatus is that it only works under very specific circumstances. Intuition works when the environment is stable and an individual has the opportunity to spend a great deal of time learning about it. . . . Trouble arises when individuals rely too heavily on their experience in making automatic decisions. When we age, we tend to avoid exerting too much cognitive effort and deliberating extensively over a decision that needs to be made. We gradually come to rely more on rule of thumb. This means that we make poorer choices in environments that are complex and unstable. Organizations also lose skill with age. Probably the best explanation for why companies decline is that they fall prey to organizational rigidities. Companies must balance exploiting profitable markets with exploring new markets. Exploiting known markets requires optimizing processes and executing effectively, and leads to reliable, near-term successes. Exploring unknown markets requires search and experimentation and offers none of the immediate benefits of exploitation. Finding the best balance between exploration and exploitation depends on the rate of change in the environment. When change comes slowly, the balance can tilt toward exploitation. When it comes quickly, an organization must dedicate more resources to exploration, since profits are quickly exhausted. In general, companies tend to lean more on exploitation, which increases efficiency and profits in the short run but makes the company rigid, a state of affairs that only grows worse with age. Similar to aging individuals, companies rely on methods and rules of thumb that worked well in the past rather than embrace novelty. Companies, too, follow an arc of skill. Checklists, are also important because they guide behavior. Sometimes, of course, you want to defend against luck. If you’re a heavy favorite, you want to neutralize the other teams luck, so your aim should be to simplify the game. When you’re the underdog you want to make the game as complex as possible. Effort and strategy can compensate for skill. And if you need another reason to read The Success Equation: Untangling Skill and Luck in Business, Sports, and Investing, you can find a copy on Warren Buffett’s Desk.